From the first meeting of four Chicago businessmen in 1905 and the formation of the second club in San Francisco in 1908, Rotary has grown into a global force for good, with over 1.2 million members in more than 34,000 Rotary Clubs in more countries and geographic territories than any other non-religious group. The passion to make the world a better place. 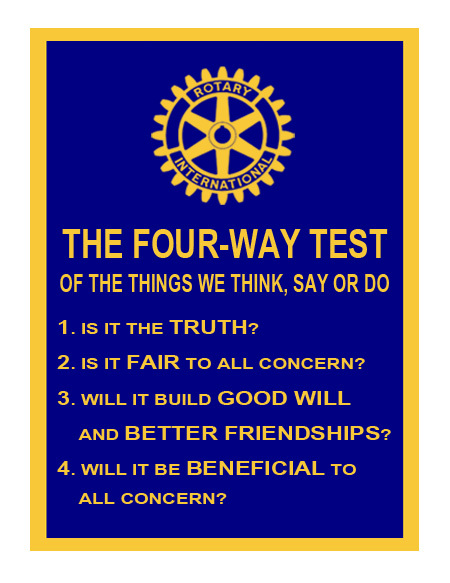 Dedication to fairness and strong business ethics as evidenced by the Four-Way Test. The commitment to strive for world peace and greater understanding between the peoples of the world. A special bond of kinship with all other Rotarians. Whenever and wherever you travel, there is always a Rotary Club nearby. Rotarians are always welcome — expected, actually — to visit the local Rotary Club. Rotary International (RI) is the worldwide organization that ties all Rotary Clubs and all Rotarians together. Rotary International works with clubs to sponsor programs throughout the world that provide clean water in remote villages, build schools, fight illiteracy, and offer micro loans to start small businesses. Since 1988, RI has been working to eliminate polio from the world in partnership with the World Health Organization, UNICEF, the CDC, and the Gates Foundation. We have reduced the number of new cases of wild polio from 1,000 per day in 125 countries in 1988 to just 35 cases in two countries in 2016. We expect to inoculate the last child soon. Rotary Clubs around the world are organized into more than 500 Districts. The Rotary Club of San Francisco is part of Rotary District 5150, which includes about 50 clubs in the Counties of Marin, San Francisco, and San Mateo.